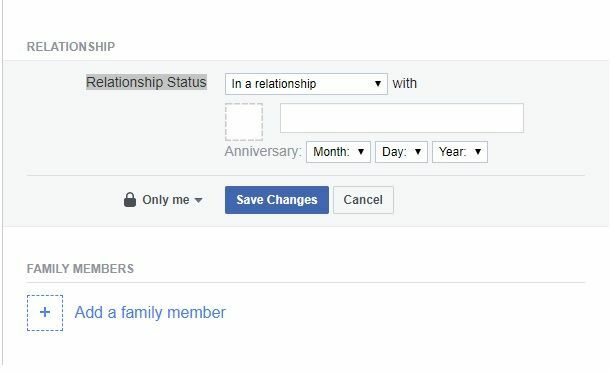 How to Request to Be in a Relationship on Facebook? You just start to a new relation and you would like to announce it on Facebook? You will need to send a request to be in a relationship on Facebook and your friend should approve this relationship status change. We are going to tell you how to request this relationship status to your friend on this page for you. If you have any questions regarding this, please let us know through sending a comment. Click on your name at the top menu of Facebook. Click on “About” button on the page. You will see “Family & Relationships” at the right sidebar. Click on “Add your Relationship Status”. Select “In a Relationship” from the selection. Type the name of the individual next for sending relationship request. Your friend will receive the relationship request and he will respond it soon. When he accepts the request, his name will appear on your relationship status. Click on “About” on the page. Go to Family & Relationships. Select “—” from the options. Now you removed your relationship status from your account.